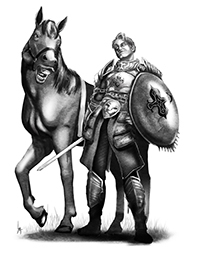 From the very beginning of the game the paladin has been a class surrounded with contention. In my experience it is the paladin code and what that code means causing most arguments. Many players feel that the code a paladin is required to follow is used by the Game Master as a stick to force their character into certain behaviors. Game Masters, on the other hand, feel that players want the perks of the class without having to play the class correctly. I doubt anything I say affects the argument one way or the other, but it is a part of the game I have thought about quite often and figured I would share some of those thoughts today and follow up on in later posts. Why is There a Code? The concept of the paladin, a holy warrior who was granted amazing power in order to fight evil, existed from the beginning of the game. This power had to come from somewhere, and that somewhere was from the gods themselves. If a god was going to grant a human that much power, that god wanted to be assured the paladin would use it as intended. Thus the paladin code was created. This makes sense when you think about it. After all, why would a being as powerful as a god give that power without requiring something in return? Not only would the god want something in return for granting the paladin power, but it would want to make sure that power didn’t get used for evil. This meant that not only did the god require the paladin to follow a code, but if the paladin did not uphold the code there needed to be someway to take the power away. While most everyone agrees that the concept of the paladin code makes sense, it is the god taking away a paladin’s power that causes problems. This is understandable, no one likes their character to lose powers simply because they did something against their code. The problem is that the paladin code is central to the concept of the class and without that code the paladin simply becomes a somewhat over-powered fighter. While over time, the game has softened up on the paladin class (which anyone can attest who has played through all five editions* of the game), even in today’s version the code is there. Most people agree there should be a code, but what constitutes violating that code? What happens when that code is violated? All these can be hotly debated topics. I am going to explore this debate in future posts, but for now I need to let you all go. In the mean time, I would love to hear from other people. If you have thoughts about the Paladin and the Paladin code, feel free to drop a line in the comments section below. Until next time, happy gaming! ← Hirelings – Making your world real! I’ve always loved playing paladins. I think you’re right that a lot of people feel like having a good is too restrictive, but there can be a lot of freedom to be found in having some guidelines like these. There are so many great role-playing moments to be had if you allow yourself the opportunity to discover how these edicts work for your individual character within your own religion. I agree, and I also love playing paladins. I think a lot of players look at the paladin as a collection of powers rather than a character with a mission. I know that personally some of my greatest role playing moments where when I struggled with making choices between following my code and following my heart. When I played AD&D as a kid in the early 80’s I played a paladin, partly for the awesome powers but mostly because the illustration of the “paladin in hell” in the original players handbook was the coolest thing I had ever seen that wasn’t an Iron Maiden album cover. I spent hours rolling ability scores until I got 17 charisma. After getting the required numbers ( this was back in the old days when you had to roll your abilities in order no rolling six numbers and then plugging them in where you want) I was ready to adventure. That weekend my best friend DM’ed me through my first adventure, I think it was the “Keep on the Borderlands” module. I completed the adventure, I protected the weak, I punished the wicked, I smashed the altars of the evil deities. I was feeling pretty satisfied with my badass paladin self until my friend pulled me aside at recess on monday and told me my paladin was acting too impulsively and if I didn’t adhere more closely to the Lawful Good alignment he would be forced to knock me down to a 1st level fighter. I think you ran into a case of the DM having one idea about how a Paladin acts and you having another. It is that problem that seems to cause the most argument. I can’t speak for every DM nor can I speak for every player, but I know when I first started doing the DM thing I was probably a little stricter than I needed to be and it frustrated a player or two. As I grew as a DM I learned that you don’t need to punish every little slip up. I actually follow this article up with thoughts on what constitutes a violation of the Paladin code and what to do You should check it out if you haven’t already… thanks for the comment! Part of the problem with the paladin is in its presentation, lots of nifty superior abilities and then giving only one way to officially to provide character balance. A very Gygaxian style of presentation which is ok if you learned from mentors nuance. Not so easy if you or your GM learned from books. There is a better presentation: Divine Warrior. The character has entered into a divine contract that gains the character divinely blessed powers on top of being a Fighter. then the contract should spell out: advantages, penalties, parties to whom obligations are owed, mediators/interpreters, who it is with, etc… all of which should be negotiated long before hand by the DM and the player to create a real document both can interact with and refer to. It shouldn’t be completely boilerplate, should have some grey areas deliberately and should never be written to intentionally harm greater parts of the design of the divinity or those to whom the Paladin owes allegiance to. The Prime example being the “Let us violate the kings orders, military axioms and tactical sense because my code says CHAAARGEEEE!! !” as the 1E UA implied nay demanded. No wonder ‘lawful stupid’ became a phrase. A Paladin of Dionisis could ignore the drunk penalties but must never refuse a drink given in true hospitality. While a Paladin of Thor might gain per level 1d6 worth of lightning bolts usable per week so long as he does not shy from combating evil Giants. And a Paladin of Hecate should gain benefits while protecting Magic users but need to punish adulterers.